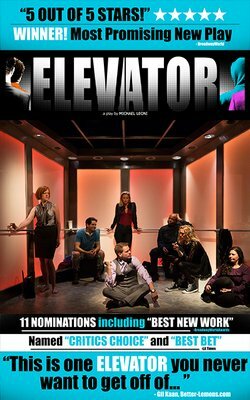 ELEVATOR, written and directed by Michael Leoni, is extended at The Coast Playhouse (8325 Santa Monica Blvd.) in West Hollywood. The cast features Devon Werkheiser (Nickelodeon’s Ned's Declassified School Survival Guide) William Stanford Davis (Showtime’s Ray Donovan), Deborah Vancelette (FX's Terriers), David Abed (Blue Man Group), Karsen Rigby, Erica Katzin, Vivi Thai and Kristina St. Peter. When seven strangers get stuck in an elevator, it’s only a matter of time before their truths are revealed. One by one, stereotypes and judgments are shed and preconceived notions are challenged at every turn. Featuring musical sequences and a cinematic style, ELEVATOR is a comedic and emotional ride into the human psyche asking the fundamental question: Who are you behind closed doors?